Background: Gastroesophageal Reflux Disease (GERD) is frequently associated with pulmonary symptoms. Symptoms such as asthma, cough and wheezing may be severe and occasionally life threatening. Unfortunately they are not necessarily recognized as caused by reflux. Therapy can exacerbate the symptoms by causing worsening reflux. Laparoscopic Fundoplication has proven to be very effective in controlling reflux but its effect on associated pulmonary symptoms is less clear. 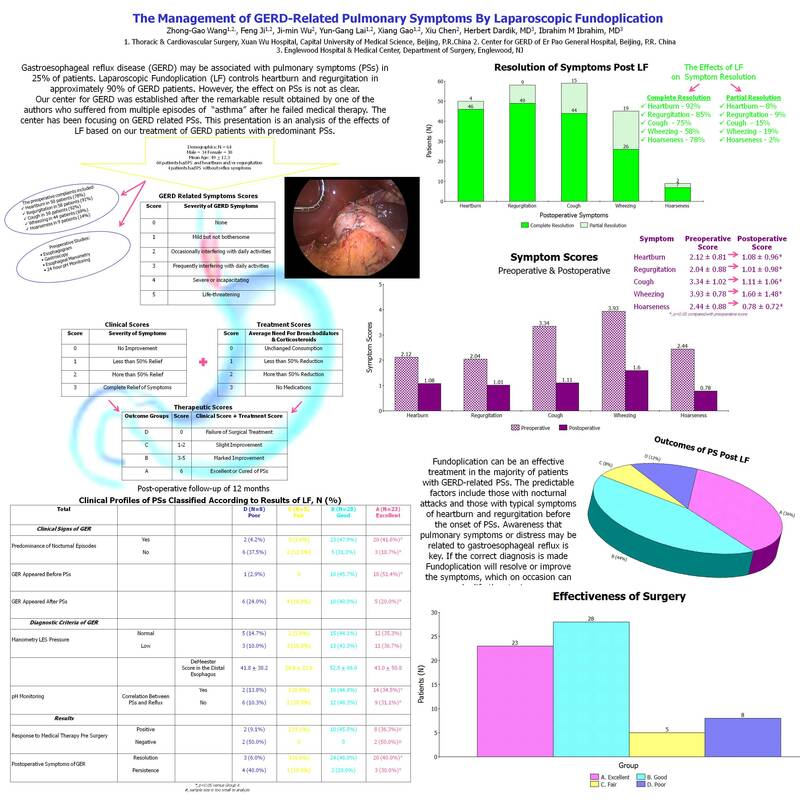 Materials and Methods: From January 2007 to October 2008, 64 patients with GERD-related pulmonary symptoms (PRs) were consecutively selected for laparoscopic Nissen fundoplication. Of these, 60 patients had gastroesophageal reflux and pulmonary symptoms, while 4 patients had purely pulmonary ones. All patients had gastroesophageal reflux disease confirmed by 24 Hr. pH monitoring and lower esophageal manometry but failed medical treatment. Every patient filled a questionnaire regarding the severity of symptoms and medication taken before and after the operation. To evaluate the outcome of surgery, a method for scoring was developed. The mean follow up was 12 months ranging from 6 to 24 months. Results: A cure or excellent control of symptoms was achieved in 23 cases (35.9%); good or marked improvement in 28 (43.8%); fair or slight improvement in 5 (7.8%); poor or no improvement in 8 (12.5%). The mean pulmonary symptoms score decreased from 6.3 ± 2.65 to 2.33 ± 2.37. The best results were obtained in patients whose GERD symptoms preceded their pulmonary symptoms and who had high Demeester score on pH monitoring. Conclusion: Laparoscopic Nissen fundoplication can be an effective treatment for the majority of patients with GERD-related pulmonary symptoms.